A boy had a dream about fireworks. 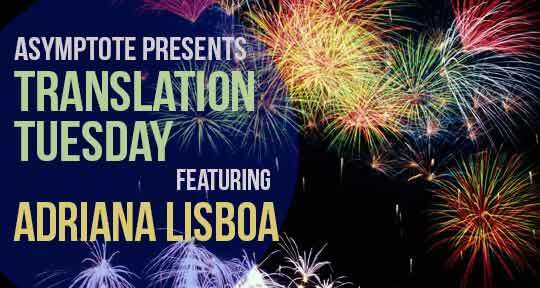 In this piece by Adriana Lisboa that could be classified as micro-fiction or a prose poem, a reader discovers a poet who has transformed fireworks into words. Reminiscent of the Brazilian writer’s longer work, the piece plays with the possibilities of language and its sound in a way that is surprising to the reader. Enjoy! Years later, he found out that words sometimes formed verses. He became a poet and during his entire life he wanted to describe the itinerary of that dream from his childhood. He dug through dictionaries and discovered the possibility of creating hybrid images like mermaids or manticores. Verses that sounded like freshly brewed coffee, that corrupted like pure sugar-cane rum, that saved like a white lily. Years later, he published his anthology of poems. The last one was called The Parallel Fires and it was the realization of his life project: fireworks transformed in verses. Years later, a certain reader bought the anthology. When she was reading the last poem, she noticed that the words took on different colors and shone against the black background of the white page, obfuscating the stars, and impregnating the whole book with a discreet smell of gunpowder.